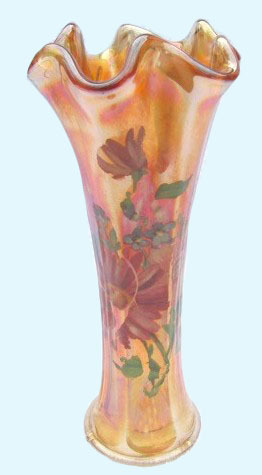 8 inch BUTTERFLY & BERRY Vase in Marigold. 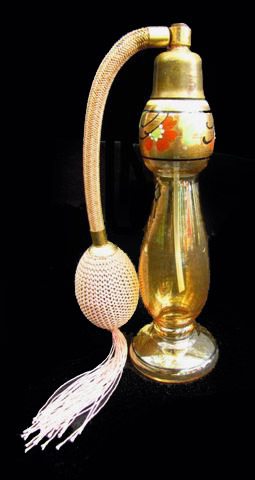 PERFUME ATOMIZER: This is possibly a “one-of-a-kind”? It appears to have been decorated by one of its owners over the years. When commercially advertised, none were hand-painted. 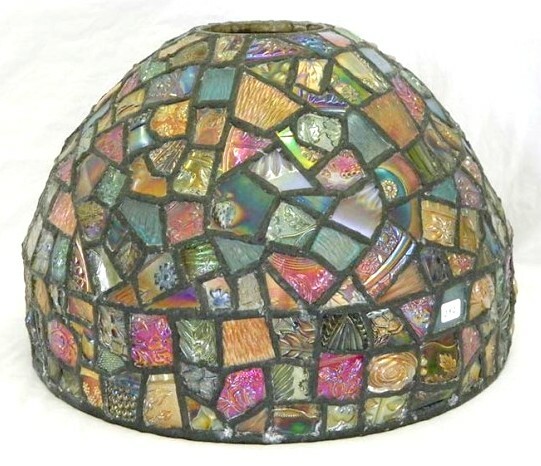 LEADED GLASS Shade: Handcrafted from broken items of carnival glass. 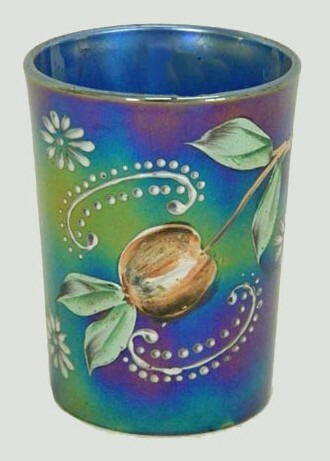 CHERRIES Tumbler: Said to be a one-of-a-kind, the addition of the white flower and scrolls separate it from the usual design. Some “personal handi-work” was applied somewhere along the line of ownership. Blue CHERRIES & BLOSSOMS on Cannonball pitcher. Fenton's #1576 - OR - a Northwood version. 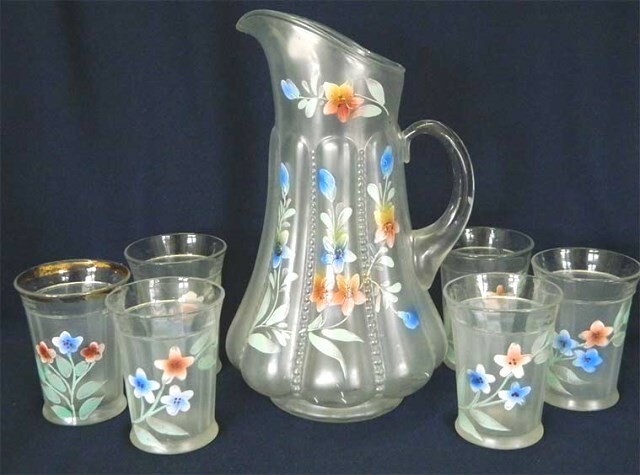 CHERRIES and BLOSSOMS Waterset: Basically, this is a Cannonball pitcher. 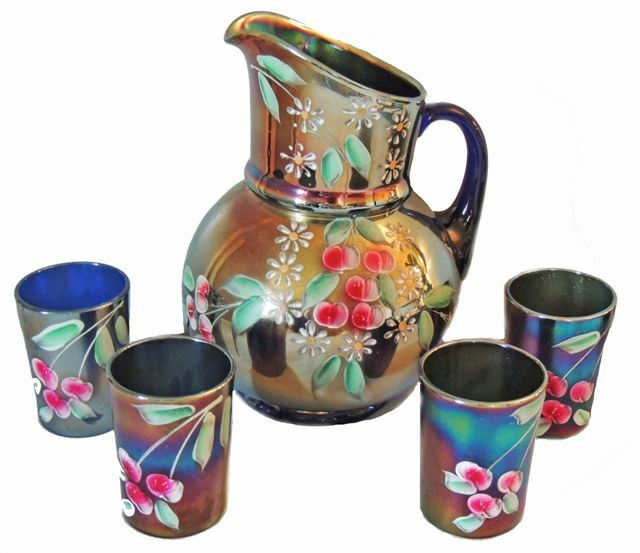 The variations of painted design can be Cherries, Cherries and Little Flowers and Cherries and Blossoms. CONNIE Waterset: This white set was named for the late Connie Moore. The Pitcher sold for $800. in a 1995 auction. Each tumbler brought $175. When sold in a 2014 auction, a 7 pc. set brought $500. CARA NOME 7 pc. water set. CARA NOME Waterset: Dave Doty states a white 7-pc. set sold in 2014 for $225. A light green tumbler in the pattern sold for $50. 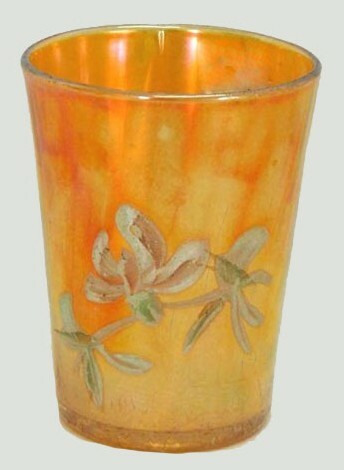 LOTUS Tumbler: This Fenton pattern is quite scarce. The pitcher is in the Cannonball shape. The centered flower with green leaves on either side can be found with some variation in the leaf tendrils. The pattern can be found in marigold and green. 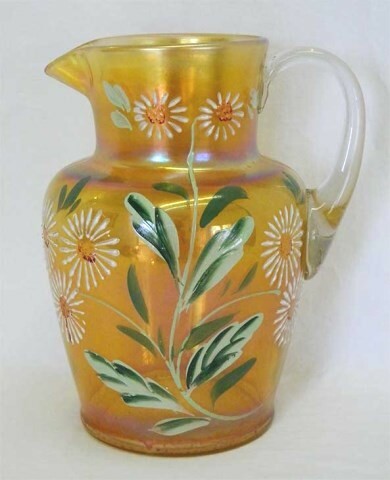 DOUBLE DAISY VT. Pitcher: The “original” Double Daisy design was applied to the Cannonball shaped pitcher. This variation in shape may indicate a better name: ENAMELED DAISIES VT #1? 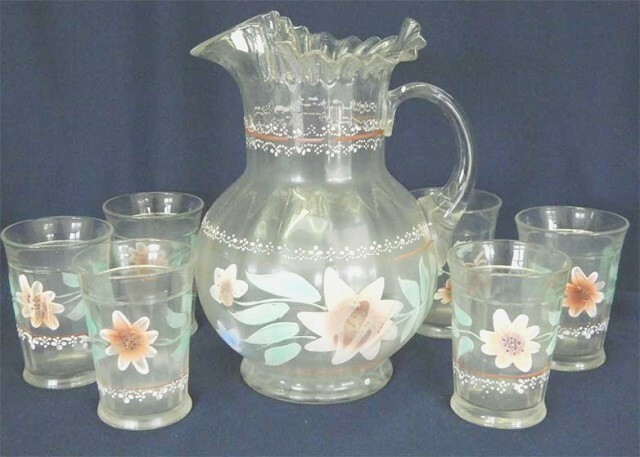 Double Daisy Vt. water set #2. DOUBLE DAISY VT. #2 Tumbler: Should this be ENAMELED DAISIES Vt. #2? 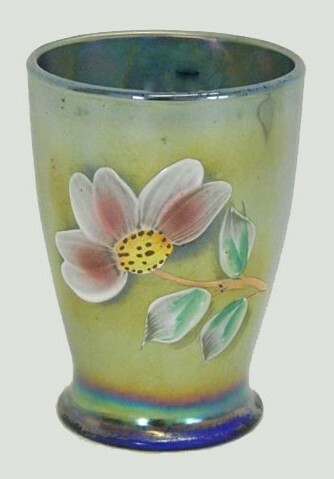 DAISY Tumbler—(no flowers): Obviously the Northwood tumbler shape and painted Daisy, but for whatever the reason—no Little Flowers? 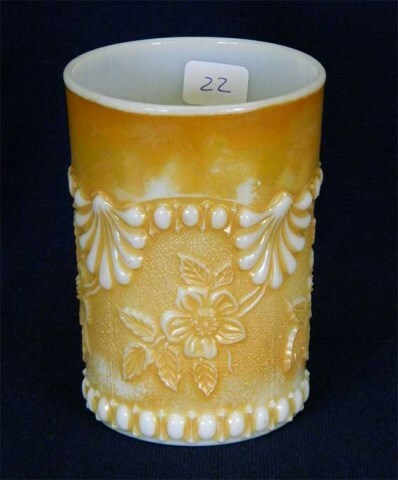 APPLE BLOSSOM & SHELL Tumbler: Not seen with any regularity, it would be difficult to determine the origin. 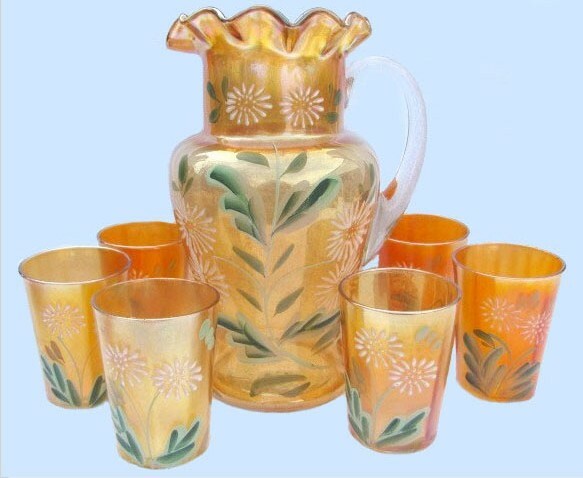 If you will check into our PHOENIX GLASS segment where other items known to have originated from well-known manufacturers of iridized milk glass are discussed, you will find that the finished product might possibly have come from any of three producers. and they will turn their ears away form the trutth, and be turned aside to fables.